Please welcome to our little team of analysists and helpers Chris Gluck, whose PWP is going to be added to the metrics table this year---a solid instrument in telling us how teams have performed in turning possession into goals. Currently it's one of the best open-source metrics out there to tell us such things. I hope you'll enjoy his contributions as much I will - Harrison First things first --- my thanks to Harrison Crow and Matthias Kullowatz for the opportunity to post my Possession with Purpose Introduction on American Soccer Analysis. If you’ve been following me this past year through Columbian Newspaper--out of southern Washington--you’ll know that I’ve been researching statistics in Major League Soccer. My intent has been to develop a simplified (Strategic) set of team performance indicators that may help others better understand soccer and how the outcome of a game may be better understood based on the primary inputs to the game. Data for my research comes from documenting and analyzing all 646 MLS Regular Season games in 2013; the source data originates with OPTA and is displayed on the MLS Chalkboard and the MLS Statistics Sheet found through www.mlssoccer.com. To first understand the context, I offer that this is one of the End States of my effort: create a simplified approach and documented method for measuring team performance where the output is an Index that (while excluding points) comes close to matching results in the MLS League Table. Note that 9 of the top 10 teams in this Index made the MLS Playoffs last year with the Houston Dynamo finishing 12th in the Index. For comparison, in benchmarking whoscored.com their Index only had 8 of their top 10 teams make the Playoffs, while www.squawka .com matched my 90% success rating, but the team they missed in the top 10 (New England) finished 16th in their Index. From a strategic standpoint, the End State objective has been met; create a simplified approach and documented method for measuring team performance where the output is an Index that (while excluding points) comes close to matching results in the MLS League Table. Minimize opponent scoring the goal. Every step is this process has an average success rate (percentage) based upon data gathered from all 646 MLS Regular Season games. In case you missed it I call these Processes and the Indices “Strategic” to separate their value/meaning relative to other things that can influence the outcome of a game. Tactical metrics: Locations of shots taken, shots on goal, and goals scored; penalty kicks, free kicks, crosses, headers won/lost, tackles won/lost, interceptions, clearances, blocked crosses, blocked shots, etc. 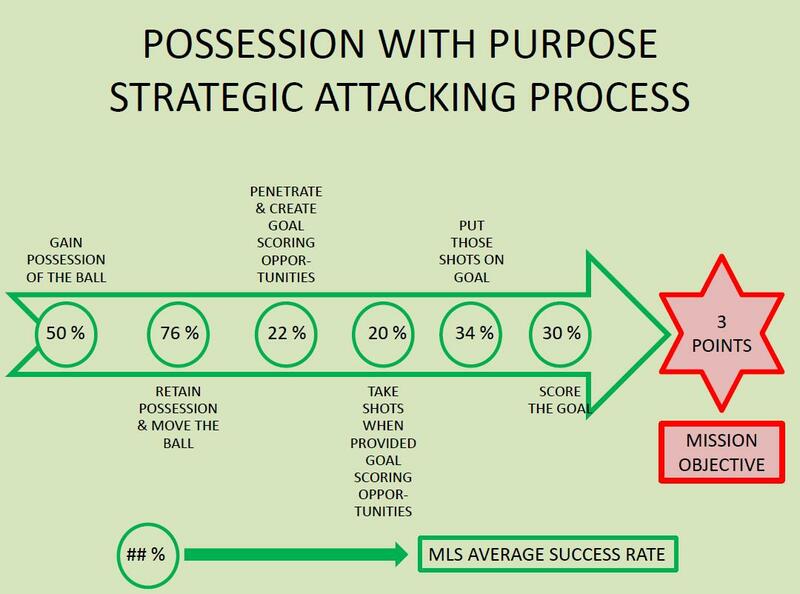 The diagram below shows the PWP Strategic Attacking Process with the average percentage of success rate in MLS for 2013. A more detailed explanation of each step is provided below the diagram. Step 1: Gain possession of the ball: The intent behind this basic step should be clear; you can’t win the game if you don’t possess the ball to some extent. A second consideration about this step is that the more you possess the ball the less your opponent possesses the ball. From a defensive standpoint there are any number of ways a team can work to gain possession of the ball; they include, but are not limited to, tackling, intercepting, clearing the ball, winning fifty-fifty duels on the ground or in the air, or simply gathering a loose ball based upon a deflection or bad pass. For this Process the measurement of success is the percentage of possession a team has in a given game; note that in Soccer, the primary method for measuring possession is to add up the number of passes made in a game and divide into that the amount of passes one team makes (create a ratio percentage of possession); the opposing team has the difference between 100% and the percentage of possession that the other team has. Step 2: Retain possession and move the ball: It shouldn’t be a secret to many that in most cases the team possessing the ball will need to move the ball in order to penetrate the opponents Defending Third and score a goal. This is not to say a team has a minimum number of passes they need to complete to score a goal; for teams winning possession deep in the opponents Defending Third there may be times where the only thing needed is a quick shot on goal. By and large, however, most teams – when they gain possession of the ball – do so in their own Defending Third and then move the ball (eventually forward) in a position where a teammate can create a goal scoring opportunity for another team member to take a shot. For this process, the measurement of success is the team's passing accuracy percentage across the entire pitch; passes completed divided into passes attempted. It’s not perfect, but it provides a simplified ratio to compare one team versus another; statistically speaking there are weaknesses in how this percentage is measured by the big data folks. Throw-ins, for example, move the ball across the pitch from one player to another yet they are not officially counted as passes. Successful crosses are also not counted as a successful pass even though the ball moves successfully from one player to another. I should also point out here that there are occasions when a team wins possession of the ball and takes a shot where no pass was completed. Like I said, this measurement method is not perfect but it is ‘equal’ in ignoring that exception for all teams. Therefore the measurement itself has value in tracking the majority (bell curve) of activities that normally occur in a game of soccer. And as a reminder, these are Strategic steps in PWP; by definition a Strategic step will not measure to a level of granularity; that is where Tactical metrics come into play based upon an Operational condition where the team is applying pressure higher up the pitch. Step 3: Penetrate and create goal scoring opportunities: Most know that a pitch is divided into three parts; the Defending Third, Middle Third, and Attacking Third. For the purposes of this effort, Penetration is associated with entering the opponent’s Defending Third with the intent to score. For this Process, penetration is measured by dividing the volume of passes a team completes within the opponent’s Defending Third into the volume of passes a team completes across the entire pitch. It’s not perfect but it creates a ratio that treats all teams fairly, and given the overall accuracy of the End State Index (90%), it’s a reasonable way to measure this step. In order to measure this step I first had to manually filter, for all 646 games, every pass attempted and completed using the MLS Chalkboard; my thanks to MLS and OPTA for providing us ‘stats’ guys the opportunity to do that. With Golazo stats now available, that task will be easier next year. As a stats guy, it would have been inappropriate to switch measurement methods ¾’s of the way through the year. A fullback overlapping down the right side puts in a wicked cross that gets cleared at the last minute by a center-back, with his head. With OPTA and other data companies that wicked cross, though unsuccessful, is not quantified as a goal scoring opportunity created; it’s merely tracked as a clearance and an unsuccessful pass. I disagree; the fullback did their job in putting in that wicked cross – what really happened is the defender also did their job in clearing it – therefore a “potential” for the attacking team to complete a created goal scoring opportuinty and take a shot was denied. But as a Head Coach, I would put to memory that the fullback did what was supposed to happen; create the chance – therefore in my books that player created a goal scoring opportunity. For this Process, the step is measured by counting the number of Shots Taken compared to the number of completed passes in the opponent’s Defending Third. It’s not perfect, but it’s measured in an unbiased manner for every team, and there will be instances where a shot can be taken without a completed pass or originate from a defensive error. By tracking “failed assists” it provides a pure, statistical way, to track individual player performance (tactical metric) that can influence team performance. Bottom line on this one, as contentious as it may be for some, recall the End State of this Final Index… create a simplified approach and documented method for measuring team performance where the output is an Index that (while excluding points) comes close to matching results in the MLS League Table. Given the accuracy rating of 90% in matching the top 10 Playoff teams this year I feel and think the approach to measure this indicator works. If OPTA, or another data compilation agency starts to track “failed assists”, could an Index like this reach 100% accuracy? Step 5: Put those Shots Taken on Goal: For the most part this is an individual statistic that is added up to create a team performance indicator. For this process, the step is measured by dividing the number of Shots on Goal by the number of Shots Taken. It’s one of the easier indicators to measure, and if you watch any level of soccer, it's pretty self explanatory – if the Shot can come anywhere within the dimensions of the Goal, it is considered a Shot on Goal. One of two things happens; it goes in or it doesn’t. Step 6: Score the Goal: One critical objective of the game. I say ‘one’ because indications, I see, lead me to offer that this game is not all about scoring goals. 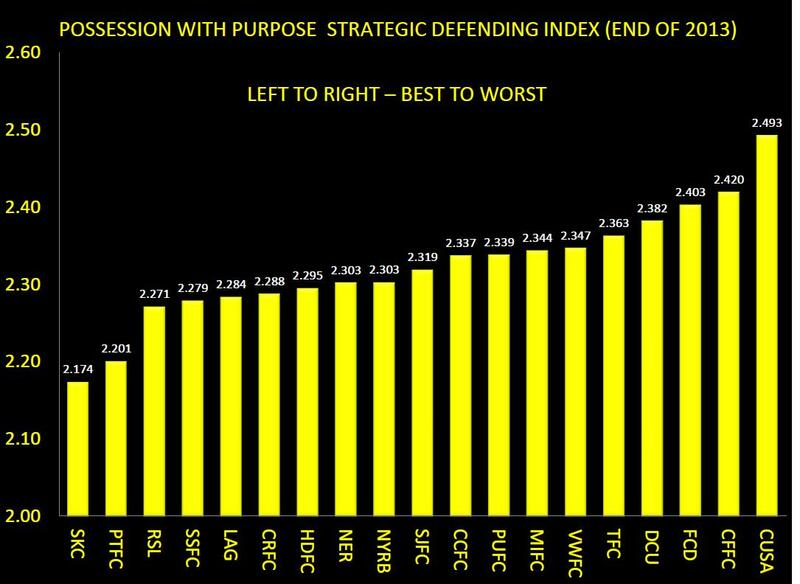 In my research it appears to me that teams who defend better seem to take more points in games than teams that don’t defend very well. It’s not perfect, but it provides reasonable information in a reasonable format that has reasonable value when comparing the End State output to how the MLS League Table finished. 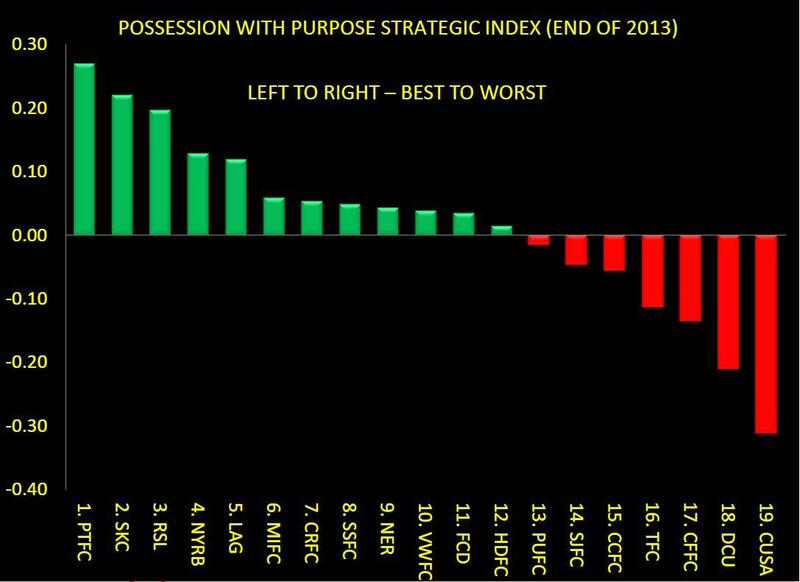 In looking at these two Indices, note the number on the left; the difference between the Index number in the Attacking Index and the Defending Index is the number that appears to the left in the Final Strategic Index at the beginning of this article. That may help explain why some teams finished above zero, as opposed to below zero in the Final Index. 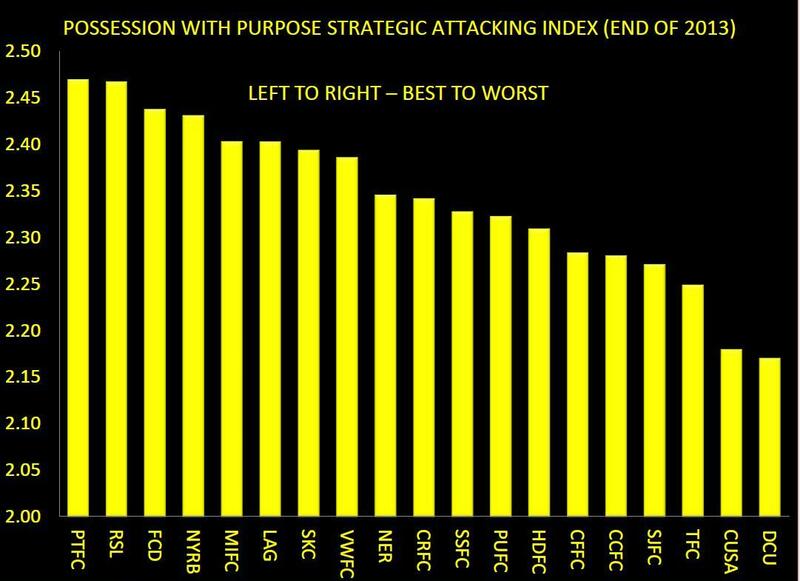 Teams finishing above zero had team attacking percentages that exceeded their team defending percentages; in other words they were better in their attack against the opponents than the opponent’s were in attacking them. Team success rates in these six steps will be used next year to begin to analyze how well the team is performing as the new season starts compared to performance the previous year. Follow Chris on twitter at https://twitter.com/ChrisGluckPTFC, and keep up with his PWP metric all season!